The future of water bottles is here. LARQ Bottle ($95) not only wants to make your water bottle chic, it wants to make the water in it safer to drink. Following a wildly successful Kickstarter campaign that resulted in $1.7 million raise (and broke the record for the world’s largest crowd-funded hydration campaign), LARQ uses proprietary and patented UV-C LED technology to purify water and eliminate harmful sources and bacteria. Simply touch of a button on the lid, and UV light eradicates up to 99.9999 percent of harmful and odor-causing bacteria and viruses—making it the perfect gift for travelers, adventurers, and those that just really, really hate germs (or when a water bottle smells). And if that wasn’t enough, it’s double-walled and vacuum sealed, so it can keep beverages ice cold or steaming hot for up to 12 hours. Recognizing this technology is incredibly beneficial for the millions and millions of people without access to clean drinking water, LARQ will be donating 1 percent of proceeds to benefit various charities that strive to make clean drinking reusable water more accessible and omit plastic pollution, through its partnership with 1% for the Planet. Four years in the making, Frank Green ($27 and up) is creating reusable water bottles with an easy-to-use, colorful twist. 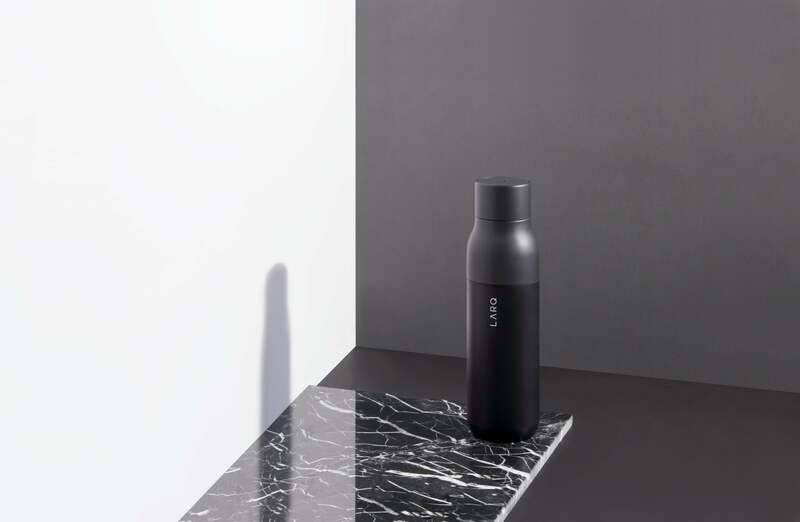 It began with the mission of ridding Australia (and eventually the world) of plastic bottles, and in 2019, they’ll have a world’s first: A travel mug with built-in Visa PayWave technology, meaning you’ll be able to simply carry your mug with you a trendy coffeeshop—no wallet, no cash, no signature—and wave it wherever PayWave is accepted. In the meantime, before the exciting launch, you can mix and match any of the color’s lids, open/close button, and base—making it a great gift for the color fiend in your life. It’s also entirely recyclable at the end of its life, so purchase proudly knowing it’ll never go back to a landfill. You probably already know the trendy BKRwater bottles, but have you seen the cool new lids they’ve created? The innovative cap ($10 and up) is actually designed with an attachable, yet removable, glossy lip balm—so take your bottle on the go with you, and have the bonus of a ultra-hydrating glossy lip treatment, too. It’s made with a proprietary blend of rose, Mediterranean algae, and French rose essence, and honestly, it’s gorgeous. We bring the balm along with us even when we don’t have our BKR bottle. According to Soma, a staggering 663 million people live without access to clean water. A heartbreaking statistic, which can feel especially strange to know when staring at expensive reusable water bottles. But this Soma Glass Water Bottle ($30) is trying to provide safe drinking water globally, which is why for every bottle purchased, portions of proceeds go to providing sustainable, community-owned water projects in developing countries. On top of doing good, the bottle itself is a beautiful work of minimalism. The world’s first temperature-controlled mug, Ember ($79.95 and up) is veryyy high-tech. Not only can you control the exact temperature of the liquids inside the mug, but you can also now track your caffeine consumption through the Ember app, which can be integrated with Apple Health. From there, you’ll be able to use the Health app data to understand how caffeine affects your heart rate and sleep patterns. 2018, baby! You’ll even be able to set and maintain your preferred drinking temperature for beverages through the app, which makes their Travel Mug and Ceramic Mug maybe the most advanced mugs on the market. Drink up!